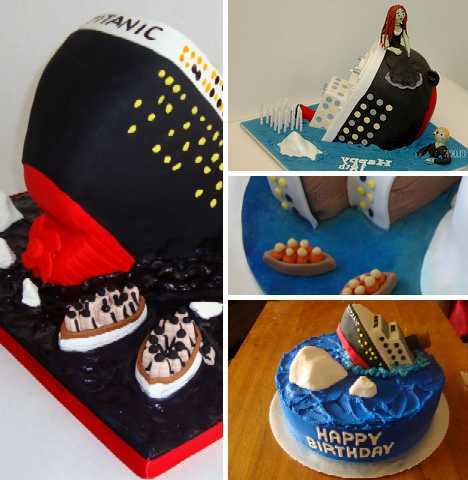 Today marks the 100th anniversary of the sinking of the legendary luxury liner RMS Titanic and in commemoration (not celebration) of the event, we present 13 creative Titanic cakes. They may not be in the best of taste but judging by the amount of delicious ice- er, frosting troweled on each one, we’ll bet they go down easy! 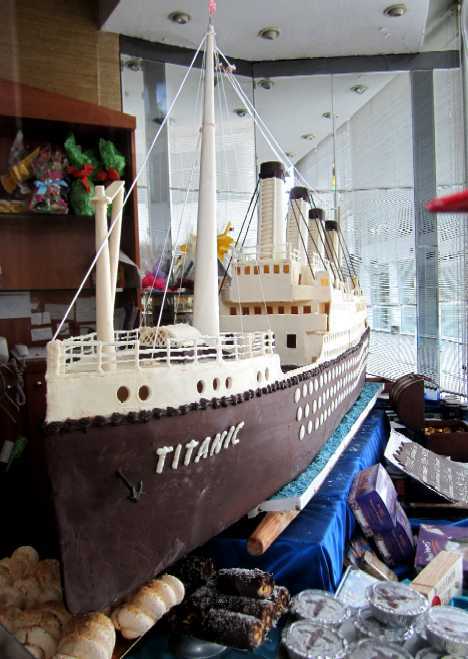 The Titanic looms large any way you slice it: historically, culturally and of course gastronomically. Speaking of the latter, Gelly Kalouta of Gellyscakes leaves lesser bakers in her wake with the stunning Sinking Titanic Cake above. Combining attention for detail with a flair for the cinematic (note the life-jackets on the passengers), this is definitely a cake to remember. 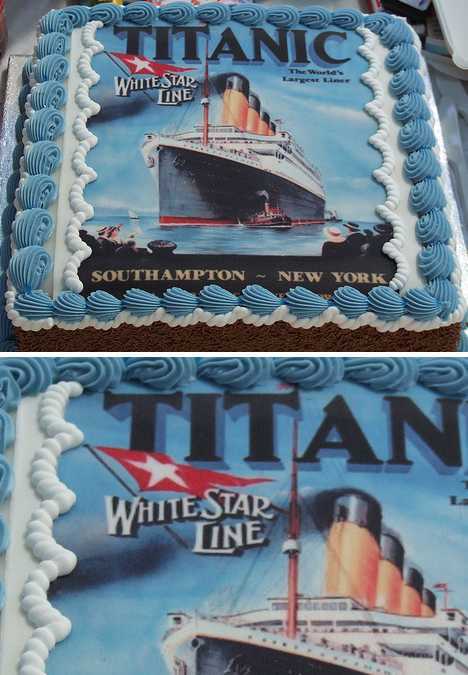 Looking for a Basic Amateur Plan for making a Titanic cake? You’ve come to the right place, if that place is Donna’s Work of Creation blog. 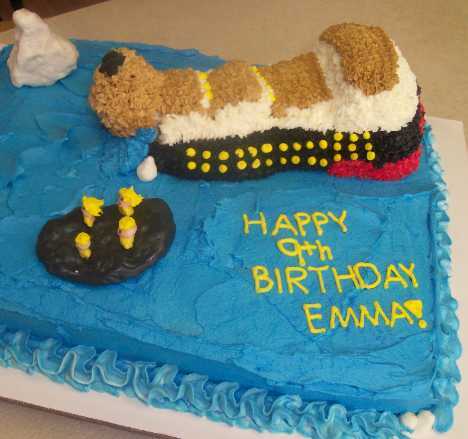 You’ll need the usual cake ingredients, a boatload of frosting and rainbow sprinkles to represent the floundering passengers and crew – note the pair of sprinkles perched on the stern to represent Jack & Rose. Donna didn’t set out to create a work of art, focusing instead on simplicity and improvisation. A perfect example of the latter is the way she used 20 assorted PEZ candies to represent the Titanic’s lifeboats. 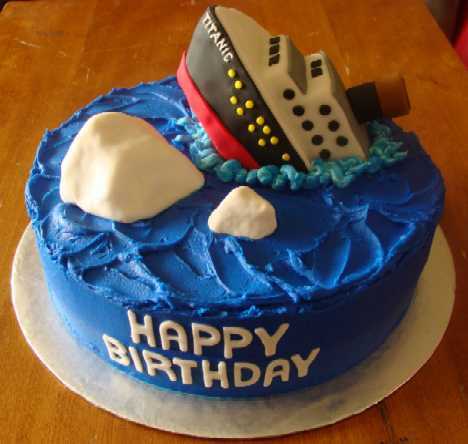 Is it wrong to pair the word Happy (and in “Happy Birthday”) with a doomed luxury liner portrayed in mid-sinking? Should Sarah of Sweet Sarah’s Cakes not have done that? C’mon now… the actual Titanic sank into maritime history a century ago while kids like 9-year-old Emma had their popular culture clocks reset by James Cameron, Leonardo DiCaprio and Kate Winslet way back in ’97. 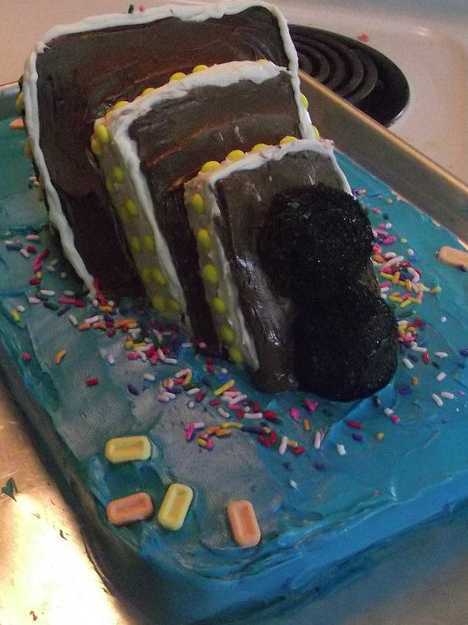 Not that there’s anything wrong with that, nor the fact that Sarah carved the ship from homemade rice crispy treats. Splash, crackle, pop? Hey, if I was suddenly dumped from my First Class cabin into bone-chillingly cold ocean water, the first thing I’d want is for someone to throw me a life preserver cookie. Well OK, that would be the second thing… after an actual life preserver. 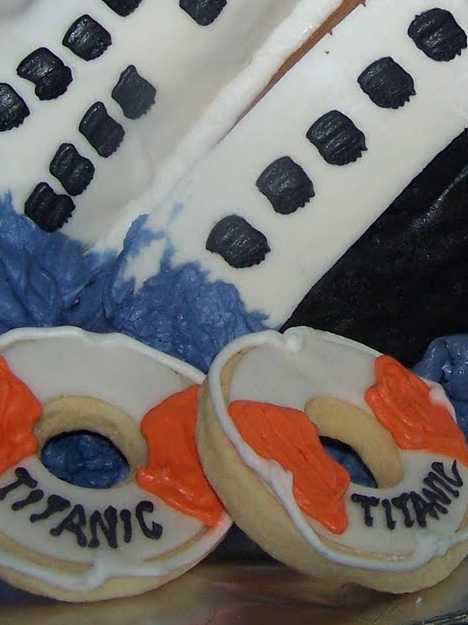 July Daly of July Daly Cakes will gladly toss you the cookies (so to speak) along with this awesome Titanic Cake. The cookies are inscribed “Titanic” in icing though they’re not very titanic in size – a pity, being as there are only two to go around. Then again, on the real Titanic such things were also provided in insufficient quantities so it’s all relative one supposes. 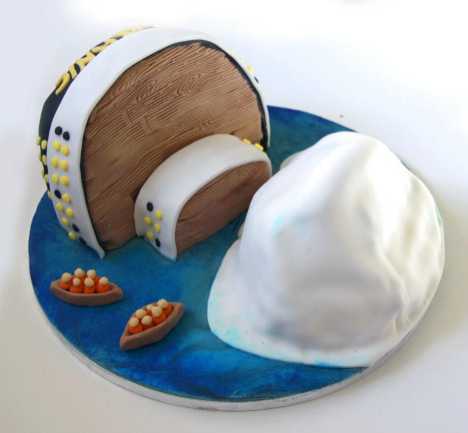 You’ve gotta hand it to Bonnie of Bonnie’s Sweet Treats, her circular Titanic cake is the tops and never mind it features a cruise ship on its way to the bottom. This cerulean blue delight sports not one but TWO icebergs… a white chocolate chip off the old block, hmm? When the cake-master at the Berliosca Cake Boutique in Vancouver, BC gets a commission to create a cake, the work is well underway before the first egg is cracked. 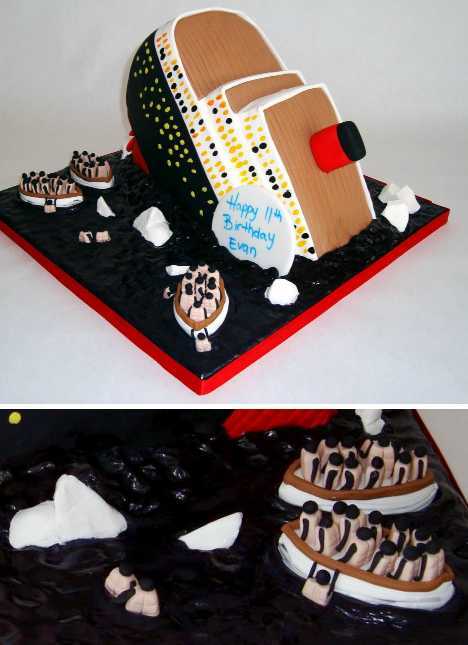 Take the masterful Titanic Cake above, made to order for lucky 11-year-old Evan and his privileged party guests. Did you know the life vests issued to the Titanic’s luckier passengers as the call came to abandon ship were not fluorescent orange but “a light salmon hue”? Putting one past presumed Titanic geek Evan was not an option so it was out with the orange an in with the salmon… the color, not the flavor. Credit Richard Skelton of Skeltons Bakery, Hull, UK with creating this loving and respectful tribute to the White Star Line’s “world’s largest” liner. The exquisite image centered on top of the cake depicts the mighty RMS Titanic in the style of an Edwardian Era travel poster – a wistful look at what was hoped for contrasting with the tragic reality that hit home on April 15th, 1912. 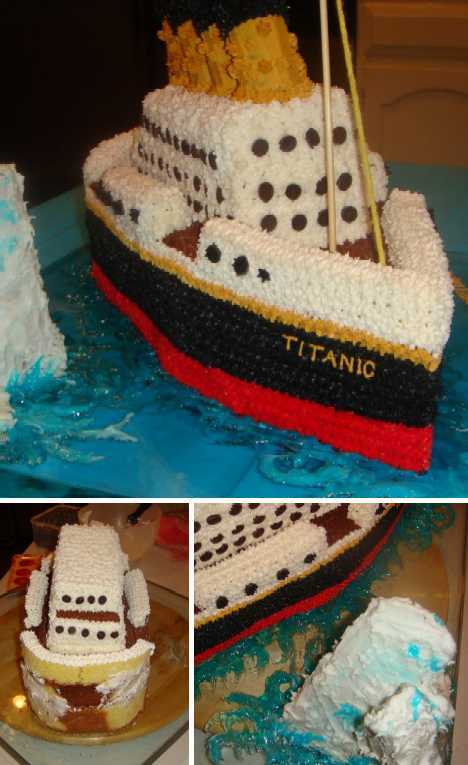 How to build a Titanic cake in just… 23 easy steps? Seriously, the lads at Harland and Wolff took less time building the real RMS Titanic which may explain a thing or two. 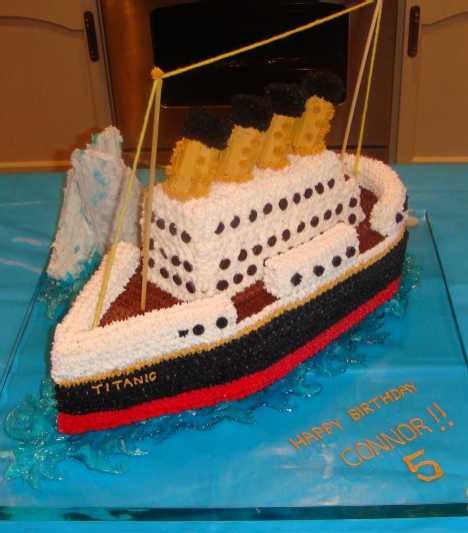 That’s why it might be better to leave it to the Party Artist instead of partying on yourself, dude, because if crafting a Titanic cake is anything, it’s a long labor of love. 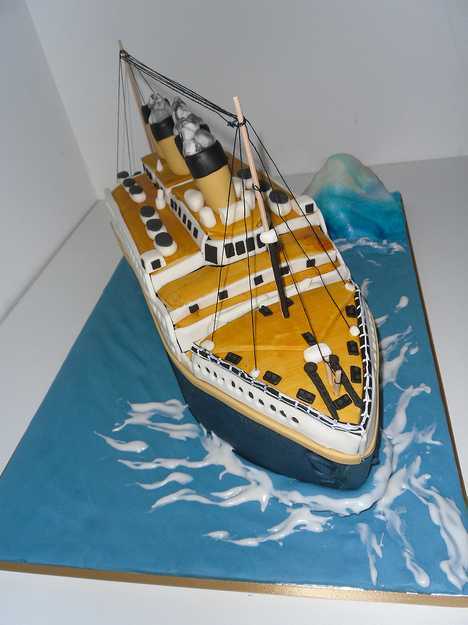 This particular Titanic cake is unusual in that it’s not captured in the act of sinking. With this cake, anything is possible: it’s about to hit the iceberg, it narrowly avoids it and everyone lives unsinkably ever after, it strikes the berg but the ice mountain sinks instead – from this cake, the time stream forks and forks again. Of course, once the pastry knife closes in for the initial slice all bets are off. 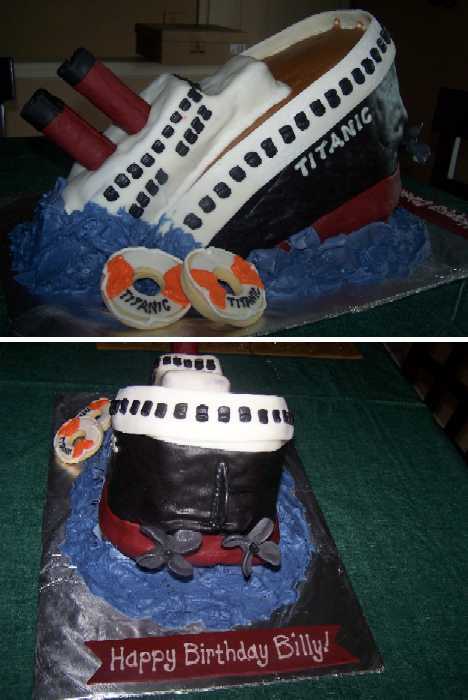 Boola’s Bakery went a different route in portraying the nose-down Titanic in delectable edible form. 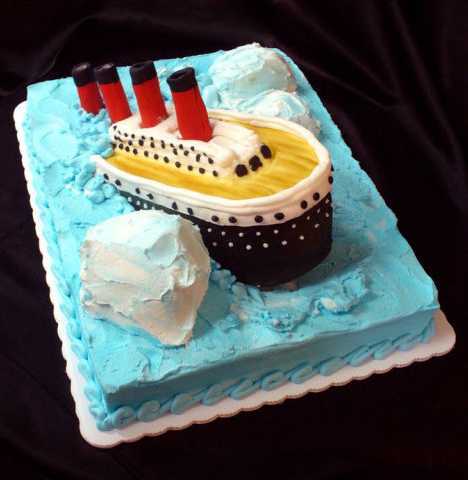 Only the ship and the iceberg comprise the two-part cake itself with the deep blue “sea” acting merely as a staging area set off by a pair of occupied lifeboats. 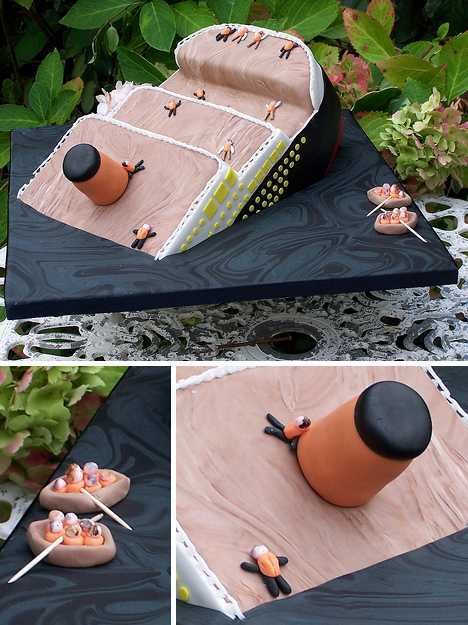 A couple of special features set this cake apart as well: the old-style nameplate on the doomed liner’s stern and the fine-grained faux wood “decking” made from marzipan evokes the actual wooden deck aboard the RMS Titanic. 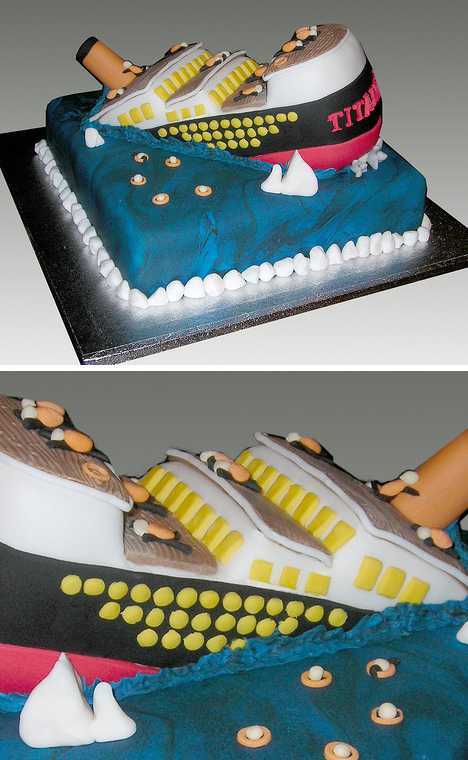 This awesome Sinking Titanic Cake from Jen’s Bakery looks far too good to eat but we’re sure it’s delicious nonetheless. The body of the cake is perfectly positioned and proportioned – it really looks like it’s sinking into the interestingly “oily” surface of the cakeboard. Hey, if woolly mammoths can sink out of sight in a tar pit, why not a mammoth ocean liner? Jen’s cake creation is a tour de force on multiple levels, or multiple decks as the case may be. Note the ten curiously relaxed life-jacketed passengers, especially the one slumped against the ship’s one remaining funnel. Then there are the lifeboats, complete with toothpick oars and the serif letters spelling “Titanic” across the stern. 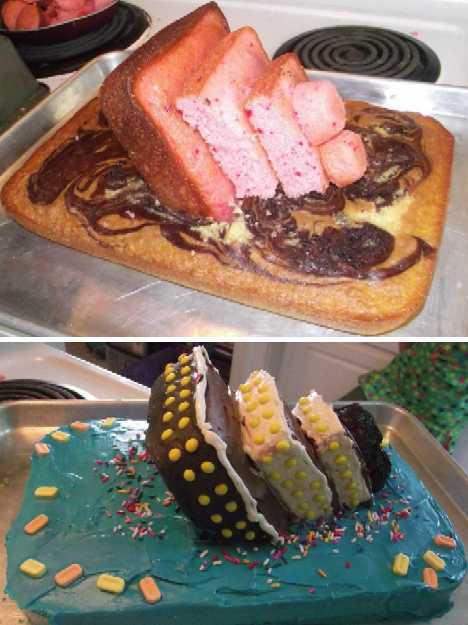 Move over, Cake Boss, a new and worthy challenger has appeared! 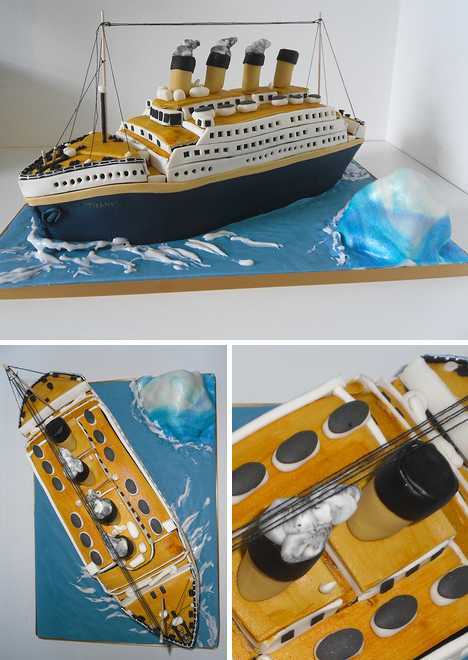 This bold and beautiful Titanic Cake from The Original Goodie Shop goes softly into that dark night, er, sea, funnels at the half-mast and icebergs off the starboard bow… and the port bow as well! Would Captain Smith have dared to chart a course directly between the massive floes as depicted on this cake? And would the dance band on the Titanic still have played “Nearer, My God, to Thee” as Smith played chicken with the icebergs? Dawn Leckie of Aurora Cakes is a stickler for accuracy in her cake designs and the breathtaking Titanic cake above is no exception. See the fourth funnel, the only one without imitation smoke wafting from it? According to reliable sources, “There were only 3 funnels operational on the Titanic. The fourth funnel was a dummy,” installed for aesthetic purposes and to match other large ocean liners of the day. See, the funnel’s a dummy, not our girl Dawn! 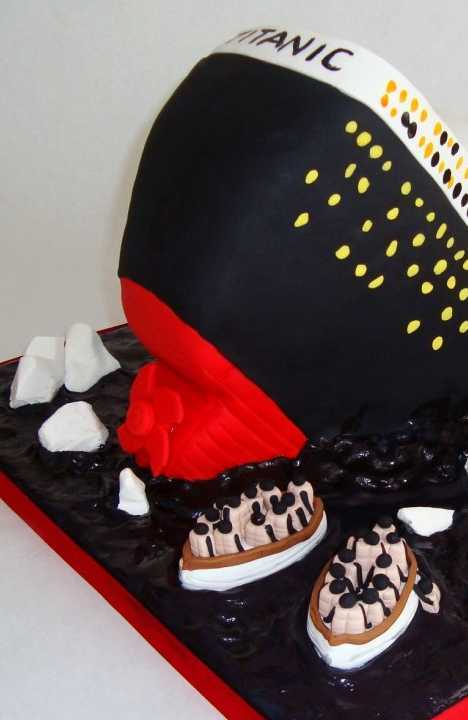 Be amazed at this Titanic cake’s rakish lean as her enormous engines and humongous rudder strain to ease the liner past the iceberg and… oh, uh, it’s just a cake, not the real thing. Can the first cut at least be on the starboard side below the waterline, exposing five of her watertight compartments and a layer of vanilla buttercream? 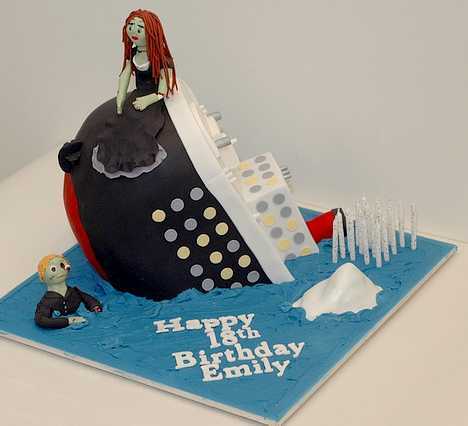 “I’m the king of the underworld!” When Pamela Jones of Cake O’Clock needed a cake for a cinematic Titanic fan who was having a zombie-themed party, she put her braaaaaiiins to work and whipped up the spook-tacular cake shown above. Supposedly it’s big enough to serve 60 people… dead or alive. Hold the icing and get with the slicing! 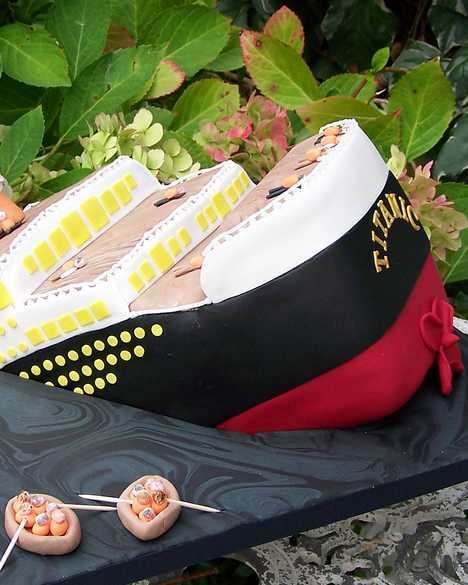 These 13 Titanic cakes may be unsinkable but they’re eminently edible, and whether your interest in the legendary liner is historic or romantic this is one dessert that WILL hold water.